Above: Holme Moss as seen from Emley Moor. 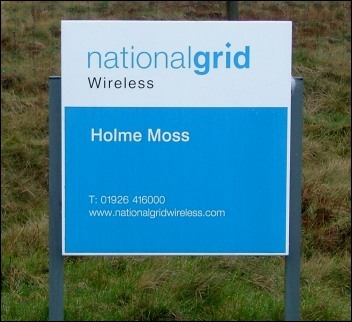 THE HOLME MOSS STATION provides the main transmission for BBC National/Local FM radio and also national DAB radio across the North of England and was originally the site of the first television transmitter in the region. It is located on a remote area of the Pennines, ten miles south of Huddersfield and just north of the West Yorkshire border with Derbyshire's Peak District. With a ground height of 524m (1719ft), the station is the highest elevated main transmission site in the UK, although it is closely followed by the transmitter at North Hessary Tor in Dartmoor with a ground elevation of 510m (1673ft). 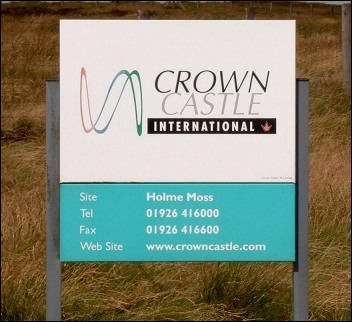 Holme Moss was built by the BBC for the purpose of extending their television service to a large part of Northern England. This was the third BBC Television transmitter to come into operation and the second of the four high-power stations designed to establish the service across the most populated regions outside of London. Built using design standards established with the first high-power station at Sutton Coldfield, the station was equipped with both primary and reserve transmitters, the vision transmitters rated at 45kW and 5kW respectively. From the aerial mounted on the 750-ft (228 metre) stayed mast, an Effective Radiated Power (e.r.p) of 100kW was delivered. 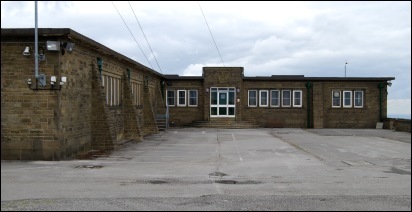 Due to the remote and highly-elevated nature of the site, the station was furnished with living accommodation to cater for the possibility of staff becoming stranded in extreme winter weather. A pumping station was also built to deliver a water supply to the site from the reservoir 800-ft below. Transmitting on VHF Channel 2, the station came into service on 12 October 1951 and placed a further eleven million people within reach of BBC Television, the transmission radius encompassing the main northern counties of Lancashire and Yorkshire, as well as Derbyshire, Lincolnshire and parts of North Wales. From 10 December 1956, the station was also broadcasting BBC National FM radio services to these same areas. 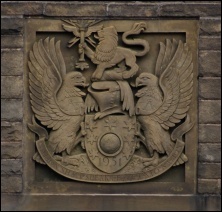 The station was however unable to provide coverage to the far northern counties of Northumberland and Cumberland, requiring medium-power stations to be built respectively at Pontop Pike and Sandale. The technical advances in station design brought about by the development and construction of Holme Moss were applied to the next high-power station at Kirk O'Shotts near Glasgow. 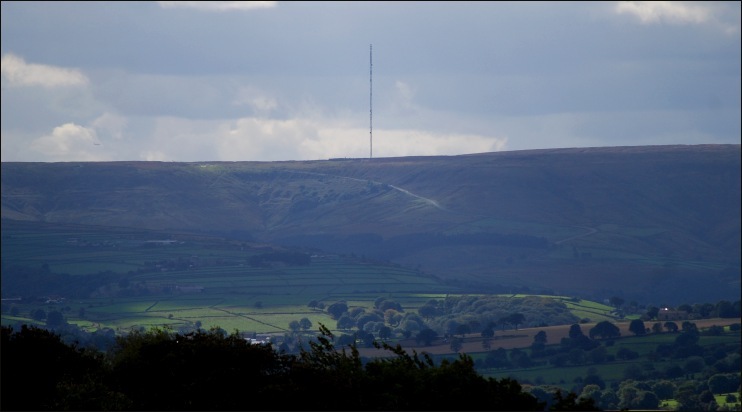 When ITV came to Northern England, the Independent Television Authority (ITA) had to build two transmitters to cover the area due to the less robust nature of their VHF Band III transmissions across the diverse terrain present in this region. 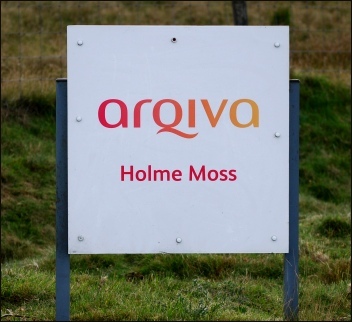 These two stations were respectively positioned to the west and east of the Pennines at Winter Hill (near Bolton) and at Emley Moor, sited around five miles north-east of Holme Moss. Inevitably, these two ITA stations were also better positioned than Holme Moss to carry UHF transmissions to the north region. These commenced with BBC2, broadcast from Winter Hill from October 1965 and Emley Moor from January 1966. 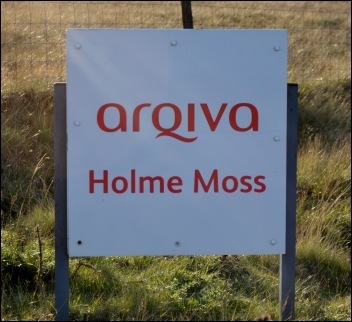 Holme Moss continued to broadcast BBC1 on VHF-only until the nationwide shutdown of the 405-line Television service in January 1985. In the run-up to the closure, a new mast was constructed in preparation for the switch over to mixed polarised FM radio transmission, the aerial system for which was too heavy for the old mast. The new mast was constructed near the old from a base point towards the rear of the station compound, with the old mast dismantled as soon as the new structure was in full service.